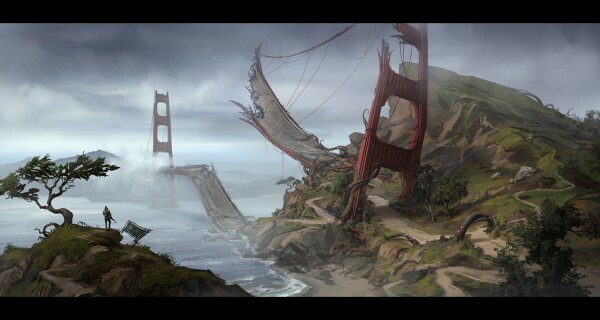 So Defiance™, at least the game portion, has launched as promised on April 2nd in the USA. In case you were trapped in some other dimension for the last three months, here's a brief description of what all the hype is about. 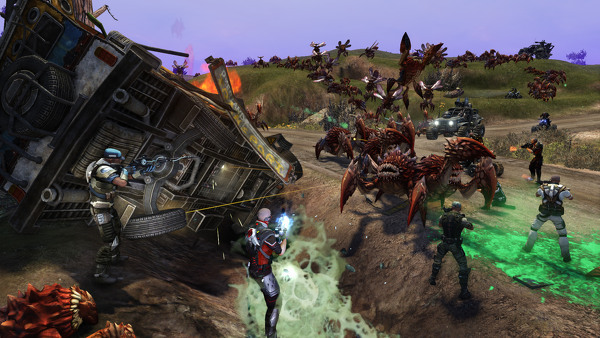 Trion, developer & publisher of Rift, End of Nations, and other popular PC MMO games, claims that Defiance is the first multi-platform massive online shooter video game that is also a ground-breaking entertainment experience, interconnecting with a global television program on Syfy. What that means is it's a third person over the shoulder shooter, with some RPG elements thrown in for good measure, that you can play on your favorite game platform, whether it be a PC, a Microsoft Xbox 360 or Sony's Playstation 3. All of which is somehow supposed to tie in with the story line for the upcoming TV series by the same name, which starts on April 15th, 2013. Are you still with me so far? With such a seemingly ambitious undertaking, 3 platforms at once, 2 of which Trion has never developed or published on, and an interconnection with a TV series looming, you'd have to ask, "Is it really ready for prime time yet?" That all depends on your own preference, but here's a five things we like about the game, and 5 that we don't. Excellent storyline and the telling of it. It could actually put more SciFi in the SyFy channel if this level of entertainment keeps up. Woohoo! The NPC voiceovers are well done, and clearly spoken. Even the raucously obnoxious Cass is tolerable. The missions are tough enough, but not insurmountable. It scales with the number of people, and the only time I had an issue was on a couple of side missions when a few other players showed up, then either left or lagged out. Guess who the tripled up mobs swarmed then! Yeehah!! Pass the ammo! The weaponry and modding system is definitely worth fooling with. It reminds me of the Planetside 2 modding system, but far more accessible IMO. You can either buy mods at vendor stations scattered across the map using the ingame currency called scrip or from MOB drops. The weapons and mobs have clearly marked attributes, and are color-coded for rarity from white to orange (known order goes white, green, blue, purple, orange). All weapons are available to every character, you basically get to decide which is your favorite go-to sets, and as you level, get to add up to 4 different loadouts. With 8 different weapon types currently, this means you can have a loadout that includes each type. Ammo so far has been free and readily available for those that have expendable magazines, typically located at or near an extraction point or in a camp. The non-class system. Being able to make your character(s) into whatever gender and type you want, whether it be stealthy sniper or assassin, gun slinging brute-power, pistol popping guerilla ambush, or support type. With a rather well balanced mix of weaponry options, EGO abilities and shield types, you can experiment to your hearts desire and discover myriad way of destroying your enemies. Even the character appearance customization seems to be varied enough without being overwhelming. Traveling in this world is extremely well done. This is a huge expanse, and quite varied, and you have access to all type of transportation to cross it. Walk or run, or better yet get a vehicle, either through completing missions or buying at the vendors scattered about. For those who hate doing either, there are various camps on the map that you can travel to from the map once you've actually made it that far. The vehicles are varied, but even the trusty A-Tex Growler Pro is very capable of covering the terrain, happily smashing hellbugs and other enemy minions along the way. The graphics and environmental / ambient sounds are remarkably well done. The vistas are beautiful, the vastness apparent, the canyons and subterranean are suitable dark, yet lit enough to see. Speaking of dark, there is a day & night cycle with well rendered colors and lighting appropriate to each that adds a unique flavor to the environment. I've yet to see holes or seams in the environment and even with server crashes, have yet to fall through the world. Connectivity issues, Being unable to connect, patch or play. This is apparently most prevalent on the Xbox 360 platform, which is what we were playing it on. But that seems to be one that all have had issues with and we do see it improving daily. And for any who have played MMO launches before, this is a familiar scenario. LaaaaaAAAAAAGGGGG. Latency, dropouts. May seem related to the previous complaint, but it's really a totally different animal, This is the type of thing that may cause premature baldness and heart attacks in 16 year olds who tear at their hair and pound their keyboards or throw the controller. Again, Trion's team is working on it, but the Xbox 360's lag issue seems to be a stubborn hellbug determined to camp out. Ineffective chat channel. Other than the annoyance that the chat tries coming up every time I summon my runner / roller (OK, that's probably MY bad), the chat channel seems rather useless. For one, on the Xbox 360, it only shows one line unresizeable of chat down in the lower right of the HUD. You can go through the DPad activated menu to pull up a full screen of it, but had better be in a safe place because you are an open target at that point for any mutant cleaver or hellbug that happens along. The invite setup for grouping, finding a party etc. is… well sortof, kinda … well not really all that helpful. I've yet to see it help if the party is outside of the range of the mini-map. It also doesn't seem to work with sharing waypoints at this time and you cannot pull up the map and see any green plus marks moving around. With the limited range of Quick chats and the tendency of most party members to spout the useless phrase "I'm over here"! on voice chat, it would be helpful to have a more robust way to create a party and keep track of their location. C' mon Trion, you did an excellent job of this in Rift! Arkfalls becoming boring and repetitive. Like in Rift, which these events very much remind me of, this starts to seem like a real grind. Rinse, Repeat and the rewards so far are nothing amazing. The storyline, as mentioned above, is well done and amazingly entertaining. It actually has me looking forward to watching the TV series. But the Arkfall events have to step it to keep my interest in them going. A couple more good things I will add are that the death mechanic works a bit like Guild Wars 2, but with more limited options, either revive or extract. Fortunately an extraction won't make you start all over on a mission, merely costing you some percentage of your scrip. The last, but not least part I want to mention is that the Trion team appears to be doing everything they can to respond to issues as they crop up, and be transparent about what is being done. Having seen this attitude from them before in previous games I've played, I'm confident that most, if not all issues will become resolved or merely minor occasional annoyances.